Wailua Homesteads is located just north of the Wailua River up towards the mountains. Access is usually obtained from Kuamoo Road although there are other feeder roads. Wailua Homesteads is technically part of Kapaa town. It’s located just north of the Wailua River. This makes it a convenient place to live for those who work either in Kapaa or Lihue. Homes along the river cliff have gorgeous views of the river, Wailua Forrest Reserve and some have distant ocean views. 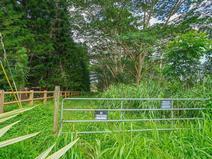 There are a number of hiking trails in Wailua Homesteads, the most popular being the Sleeping Giant trail. Wailua Homesteads Park is located there. It now includes a dog park. The areas residential community consists of a number of smaller subdivisions with starter homes to larger estate homes and lots. There are also larger agricultural parcels with gentleman farms and large acreage. It tends to rain in the evening in Wailua Homesteads. This rain keeps the, streams, rivers and waterfalls flowing. The rain in Wailua also keeps the region green and a gardener’s paradise. Because Wailua Homesteads is located in the hills of Kauai, the temperature in Wailua Homesteads tends to be a few degrees cooler compared to Kapaa town.